Fiberboard is a composite material of plastic and wood fibers, often designed to mimic wood boards. As with wood, it can easily be painted, and is a cost-effective alternative for some applications. Fiberboard is usually used to make siding, and backerboard and is commonly used for siding and decks. While fiberboard is useful as a building material, it is not fire proof, which may be a concern. It is fire resistant, insect resistant, and is considered to be a neutral building material. Fiberboard is also non-toxic, sustainable, and durable, with a 50-year lifespan being standard for properly maintained surfaces. Cement boards are large sheets constructed from a combination of cement-bonded particle board and reinforced cement fibers, but does not include aggregate. Standard dimensions are 4-foot-by-8-foot or 3-foot-by-5-foot. This versatile material can be nailed or screwed to building structures to create a substrate for fixtures such as tile floors, kitchen counters, or backsplashes. For building exteriors, cement boards can be used as a base for stucco, siding, or even on its own as the finish. As a rainscreen material, cement board offers durability, strength, and moisture resistance but is relatively heavy. Cast-in-place concrete is a mixture of aggregate and sand and is delivered ready-mixed in an unhardened state to the project site. The concrete is poured into molds, which often have rebar or other materials inside to reinforce the finished product. In addition to being used for building foundations, it can be used to construct beams, columns, floors, roofs, and walls. This type of concrete is very strong and durable, and it is touted as a sustainable solution because materials are usually locally sourced and any unused cement can be easily used for other projects. Cast-in-place concrete also has high thermal mass, and this can improve a building’s energy performance by creating an air barrier. The material’s light color also helps reduce the heat island effect by reflecting, rather than absorbing, heat. This feature can be beneficial when using cast-in-place concrete for an exterior rainscreen. The final rainscreen material is extruded concrete. Extruded concrete is concrete set in thin layers that are reinforced with glass fiber. The material itself may be made with a ratio of 90 percent sand, 10 percent glass fibers, concrete additives and pigments for color. The panels are through-colored with available dimensions up to 177-inch length by 48-inch width. Extruded concrete panels are ultra thin and lightweight but exceptionally strong, durable, and non-combustible. Panels made from this type of concrete are ultra thin and lightweight, with a thickness of 1⁄2-inch; making them at least half the thickness of cast concrete. More importantly, the material is exceptionally strong and durable, noncombustible, and is considered a high-performance concrete that works incredibly well in rainscreen assemblies. The material can be fixed with exposed rivets or screws (colors matching the panel color) or concealed using adhesive or undercut anchors. Due to their light weight, high strength, and range of options for natural finishes, extruded concrete panels can be particularly useful in many systems where stone and precast concrete would be too heavy. 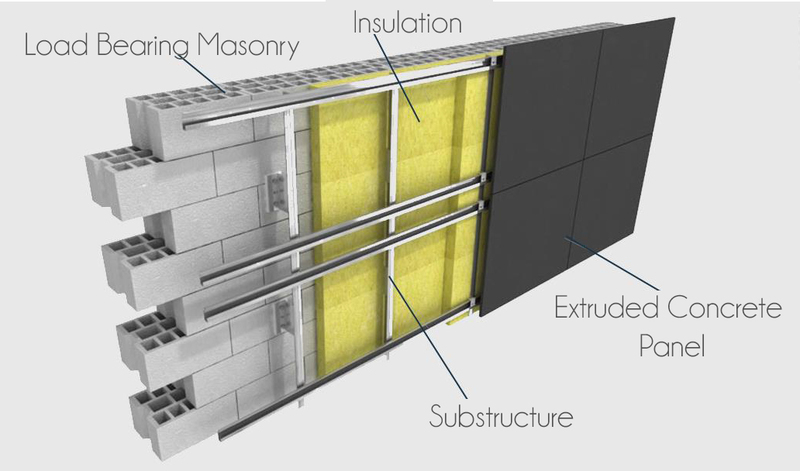 Extruded concrete panels can be used effectively in both common types of cladding installations: unitized and panelized. Unitized glass curtain walls are large preassembled glazing units that are often used in large glass towers, installed on the outside of the concrete floor slabs. The glass and the extruded concrete architectural panels can be preassembled, loaded onto the floor with a crane or outside elevator, and installed from the inside of the building. Panelized installations include cladding sections that are premanufactured in entire wall sections complete with steel studs, architectural panels, and glass units. These very large panels are delivered to the site, and a crane is used to install them directly to the outside of the concrete floor slabs. The extrusion process can quickly create very thin and very strong concrete panels, with some facilities manufacturing up to 30,000 square feet per day. The manufacturing process allows for creative design possibilities and a wide range of colors and surface treatments, thus making extruded concrete an optimal material for designers who wish to make an impact with their individual style. The goal of a rainscreen is to prevent moisture from entering the building shell, but also to provide an internal means of water drainage and evaporation if water does get through. Some systems work to force air through the wall cavity/air gap to equalize the pressure between the exterior and interior wall, thus preventing any moisture from entering. Regardless of the rainscreen design, a good rainscreen needs to meet the “ four Ds”: deflect water, drain moisture, dry any water that has penetrated the cladding, and be durable enough to withstand the elements over time without deteriorating. The physical characteristics of exterior rainscreen cladding tend to follow the four Ds carefully, but with a strong emphasis on the durability. Ideally, the material will deflect water from the building surface or, if somewhat porous, will distribute and dry the moisture before it enters the air cavity. Some materials, such as ceramic tile or different metals, may have a high gloss that can help water shear away from the surface. The trade-off with various materials, however, is that they need to balance water mitigation with weight, strength, and overall durability. From an architectural standpoint, they also need some level of design flexibility. Commonly used materials include fiberboard, cement board, cast-in-place concrete, and extruded concrete. Here’s how the various materials compare. Water mitigation: Fiberboard, cement board, cast-in-place concrete, and extruded concrete are all highly moisture resistant. However, fiberboard is not commonly used for siding because of its low fire-resistant properties. Weight: Material weight is a huge issue for both the shipping of materials to the project site and the installation. One of the main considerations is panel size and thickness, and how those dimensions work to meet a building’s needs. For example, extruded concrete panels are relatively lightweight and can easily be mounted. Larger, thicker panels may be required to handle dramatic temperature changes in extreme climates and strong wind loads. 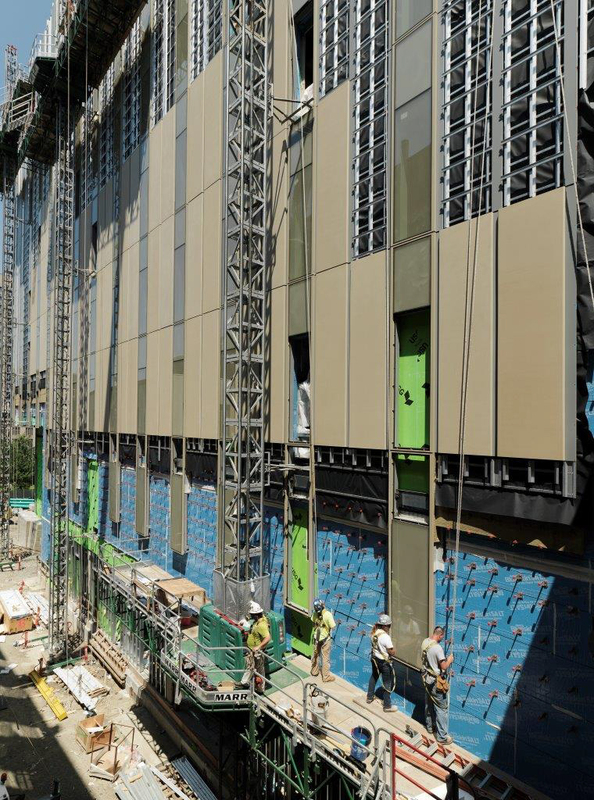 In most cases, extruded concrete panels meet the project needs in ways that fiberboard cannot. Cast-in-place concrete is a different story in terms of delivery to the project site since it is “delivered” in a ready-mix form and poured on-site. However, by its nature, whatever is produced is very heavy since the thinnest mold tends to be 1-inch thick. Alternatively, extruded concrete is a relatively lightweight material. Panels that are 1⁄2inch thick do not incur the same high shipping rates as other materials, and the relatively light weight means that the panels are easier for the building team to install. Strength: Rainscreens, and any other exterior cladding, needs to be strong enough to withstand high winds, debris, or natural elements, such as hailstones. They also must be able to handle freeze-thaw situations without cracking. When we compare the various cladding options, all of the materials stand up fairly well except for the fiberboard, which is not fire resistant. The three concrete materials are all very strong by nature, but over time, cast-in-place concrete tends to degrade if the internal rebar comes in contact with water and begins to rust. And concrete can develop pressure cracks when placed under heavy loads. However, the glass fiber layers embedded in extruded concrete create an incredibly strong material that can withstand almost anything that Mother Nature can throw at it. Durability: When you’re dealing with exterior cladding that is exposed continually to the elements, durability is critical. Not only must the cladding be able to do its job as a rainscreen, but it must also be able to do so for a long time—if not the lifetime of the building. All concrete products do well in this category, particularly in comparison to wood. Even in climates that experience wintertime freeze-thaw cycles, the panels prove long-term resistance. Design Flexibility: Given that a building’s exterior cladding is an important part of its architectural design, it is important that the material used for the exterior has some level of flexibility regarding its design, including color, shape, and texture. Fiberboard can be painted and look like wood, thus providing a long-lasting and safe design alternative to real wood. Cement board and cast-in-place concrete can both be polished to have a beautiful shine, sandblasted, or honed smooth for different surface textures, and cast-in-place can be done in a variety of shapes. Again, extruded concrete provides an attractive option; it is made of mineral-based raw materials, giving the panels their unique characteristics: lively surfaces with an interplay of color shades and light cloud effects, rather than dead and clinical surfaces, are characteristic of extruded concrete. Furthermore, it can be formed in flat panels or curves (“U” shapes), and it is through-colored instead of only painted. As a result, architects have a broad range of options for their design when they choose this material.